The toys are back in town! We haven’t caught up with Woody, Buzz and the rest of the gang on the big screen in almost a decade. This summer, TOY STORY 4 will reunite audiences with Pixar’s talking toys and introduce a few new favorites, including a faded hero played by Keanu Reeves. Here’s everything we know so far about TOY STORY 4. TOY STORY 4 opens in theatres on June 21. That’s almost exactly nine years after the release of TOY STORY 3, which opened on June 18, 2010. The first two films in the series were November releases, but summer has proved to be a good home for the toys. That June 21 date pits the new movie against the CHILD’S PLAY reboot and comes a week after the opening of MEN IN BLACK: INTERNATIONAL. The first TOY STORY 4 teaser trailer arrived on November 12, 2018. It showed the toys — Woody, Buzz, Jessie, Mr. and Mrs. Potato Head, Rex, Hamm, the Alien, and Slinky Dog — and introduced the new character Forky. They’re all dancing in a big, happy circle, until Forky freaks out and causes chaos, all to the tune of “Both Sides, Now,” written by Joni Mitchell and recorded by Judy Collins in 1967. The full trailer (above), which hit the internet on March 19, tells us a lot more about the movie. It outlines the beginning of the plot, which we’ll talk about in more detail below, and introduces a host of new characters. Two other new characters were introduced in the second teaser. Ducky and Bunny are voiced by Keegan-Michael Key and Jordan Peele, based on the Liam Neeson-obsessed valet characters from their sketch comedy show, “Key & Peele.” These characters are massive TOY STORY fans — they might not even know about Liam Neeson — but they’ve got the same crazed fandom for Woody and Buzz, even if their understanding of the details is as fuzzy as Bunny’s coat. What About the Super Bowl Ad? 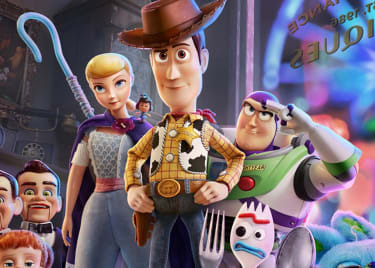 The latest footage drop from the film is the TOY STORY 4 Super Bowl ad, released on February 3. This spot gives a little bit more context to Ducky and Bunny — they’re definitely working (or living?) as prizes at a carnival game booth — and shows Bo Peep’s updated look in motion for the first time. Josh Cooley directs TOY STORY 4. Cooley is a great example of how people work their way up at Pixar. 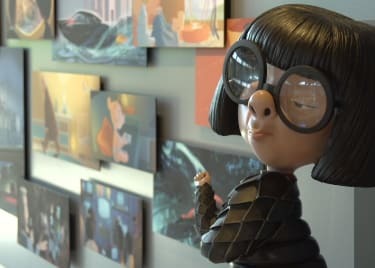 He started at the studio as an intern, working as a storyboard artist on films like CARS and THE INCREDIBLES. He wrote and directed the short GEORGE AND AJ in 2009, was credited with the screenplay on INSIDE OUT, and directed the short RILEY’S FIRST DATE? in 2015. 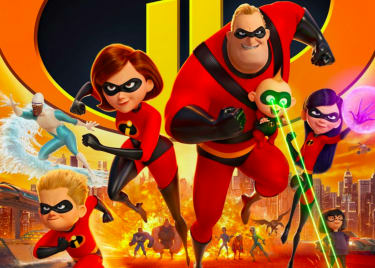 The story for the new movie was created by John Lasseter, Pete Docter, Andrew Stanton and Lee Unkrich, and Stephany Folsom wrote the final script. Wow, it’s been nine years since TOY STORY 3? That’s crazy! Let’s recap where the last movie left off. Woody and Buzz’s owner, Andy, is getting ready to head off to college. He’s outgrown his toys, and many of his old favorites are already gone. Andy plans to take Woody with him to college, and a mix-up leaves the rest of the toys thinking they’re being discarded. They all end up at Sunnyside Daycare, where the toys are dominated by the cuddly pink Lots-o’-Huggin’ Bear. They all face destruction before being reunited with Andy, who passes his playthings on to the young Sunnyside student Bonnie. Now that we’re all caught up, TOY STORY 4 begins with Woody and friends enjoying life with Bonnie. But then, she turns a craft project into her favorite new toy. Forky is basically a plastic fork with popsicle sticks for feet and pipe-cleaner arms, and he seems to have a little anxiety over his new identity as something other than a utensil for eating. That leads him to literally leap out a window during a family road trip, and Woody immediately sets off to recover him. The cowboy gets a little distracted, however, when he runs across the long-lost Bo Peep. Yes, Bo Peep is back! Time out on the road on her own has left Bo chipped and faded. But she’s stronger than she looks, and her journeys have left Bo stronger than ever. Her reunion with Woody is happy, even as it emphasizes how much she has changed. You can see a sort of cloth grip wrapped around her staff, suggesting she has used it as a weapon, and her costume is far less formal than the bonnet and pink dress she originally wore. Forky, voiced by Tony Hale. He’s not really a toy, but Bonnie likes to play with Forky, so he’s accepted by all of Andy’s old friends. Gabby Gabby, who is voiced by Christina Hendricks. This 1950s-era pull-string doll used to be able to talk with a cute voice, but a manufacturing defect has left her sounding pretty rough… and maybe a bit like a villain. She lives in a dusty antique store, with a pack of ventriloquist dummies for henchmen, er, friends. All she needs is a working voice box to get back to who she used to be. Benson is the leader of Gabby’s dummy army. Because he cannot speak, no one voices him. If a glimpse of Benson in the trailer wasn’t enough to prove he’ll be memorable regardless, producer Mark Nielsen says “the dummies are, by far, some of the creepiest characters we’ve ever created.” Yike. On the friendlier side, Giggle McDimples is a tiny plastic doll from the 1980s, voiced by Ally Maki. She’s Bo Peep’s best friend, kind of like the movie’s own Jiminy Cricket. Ducky, voiced by Keegan-Michael Key. This small stuffed duck may be a resident of an amusement park shooting gallery. He’s excitable and friendly. Bunny, voiced by Jordan Peele. The blue and green stuffed bunny hangs out with Ducky at the shooting gallery. He’s a little more aggressive than most of the toys. That’s six new characters. We said we know about seven. What About Keanu Reeves, Tho? If Ducky and Bunny are going to get as excited as their voice actors once did about Liam Neeson, maybe it’ll be over the fact that Keanu Reeves voices a TOY STORY 4 character. Reeves plays Duke Caboom, a toy licensed from the likeness of a Canadian stuntman — based on the Evel Kneivel toys made in the 1970s. As anyone who had one of those real “Stunt Cycle” toys will recall, getting that hunk of plastic to replicate the tricks seen in TV commercials was difficult at best. Duke Caboom has the same problem, and he has spent years sitting on a shelf in an antique store, mulling over his own failures. The TOY STORY cast has been remarkably consistent since Pixar released the original film in 1995. Tom Hanks plays Woody, the cowboy doll who once belonged to Andy. While Woody was threatened by the arrival of Buzz Lightyear, voiced by Tim Allen, the two eventually became friends and partners. Annie Potts returns to voice the porcelain figurine Bo Peep, who was only briefly seen in TOY STORY 3. She had much bigger roles in the first two TOY STORY films, where she and Woody had a flirtatious relationship. While Don Rickles voiced Mr. Potato Head in the first three TOY STORY films, the actor died in 2014. A new actor has stepped in to voice the character for TOY STORY 4, but Pixar has not revealed that person’s name. Estelle Harris is back as the voice of Mrs. Potato Head. Joan Cusack also returns to voice the cowgirl Jessie, and Blake Clark brings some emotion to the adventure as Slinky Dog. Wallace Shawn again plays the nervous Rex. Jodi Bensonvoices Barbie, Michael Keaton plays opposite her as Ken, and of course Pixar mainstay John Ratzenberger is on hand to voice Hamm. 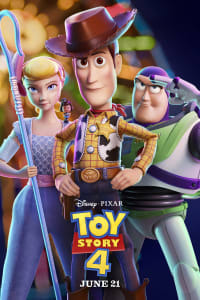 Check back with the AMC Scene for more TOY STORY 4 info!